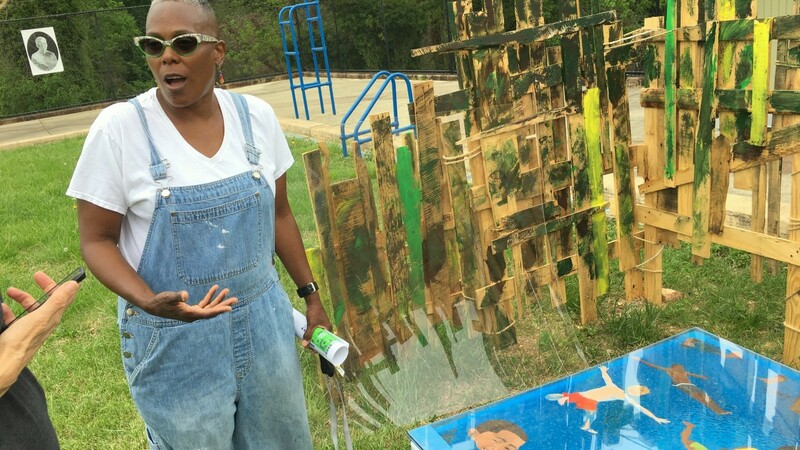 To get a feel for the long era of segregation in Baltimore – the time when Druid Hill Park had a “white pool” and “colored pool” – there’s no need to be limited to the history books. Just go to an out-of-the-way spot in the park near the backside of the Maryland Zoo where “Pool #2” (the official name of the swimming pool for African-Americans) is still there. The pool is filled nearly to the top with dirt. But pool ladders still poke up from the grass. The lifeguard stand and part of the diving board are still there. Turquoise blue mosaic tile rims the pool edge. 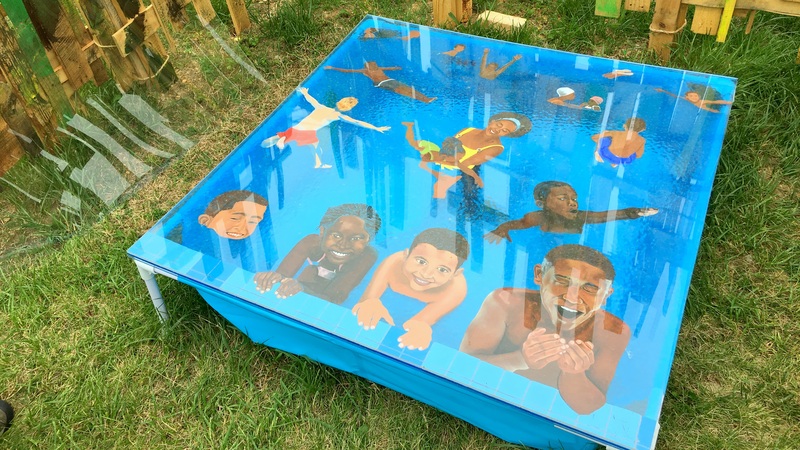 Built in 1921 and phased out after the courts forced city pools open to all races in 1956, Pool #2 became a 1999 installation by the artist Joyce Scott. Today the partially-buried pool peeks up, eerie and evocative, to offer an even deeper dive into its enduring relevance in a special exhibit, “Everyday Utopias,” featuring the works of 10 contemporary artists. “What benign neglect!” the show’s curator Sheena M. Morrison remembered thinking, when she was jogging in the park a couple of years ago and first happened upon Pool #2. Morrison, a master’s degree candidate in curatorial practice at Maryland Institute College of Art, became fascinated with the spot and ended up making a project out of it. Since the show opened on April 15, Morrison has been visiting the exhibit pretty much every day to make needed repairs or fixes and answer visitors’ questions. One of the flags on Tiffany Jones’ “I, Colored” blew down, she said. Some of the tiny white “telescopes” on Sutton Demlong’s “Myopia (or Moral High Ground)” were disturbed. The sound of burbling water, from Andrew Keiper’s sound installation “Summer Sonar,” was the backdrop for Morrison’s impromptu tour for two visitors. “Desegregation filled this pool, but it did not bury white supremacy,” Keiper wrote in the printed guide for the show. On Saturday (May 6), from 4 p.m. to 8 p.m., a closing ceremony is planned at the pool with an artists’ talk, a performance by Fluid Movement and a screening of “Shorts,” a film by Billy Colbert. Also showing will be photographs from this early incarnation of the pool by I. Henry Phillips Sr., narrated by his son Irv Phillips Jr.
Morrison said participants will have a unique opportunity to learn some of the history of Pool #2 – and the nearby tennis courts, also historically segregated – from experts as well as people who recall using the facilities in those days. “The old timers from the tennis courts will be there,” Morrison said. 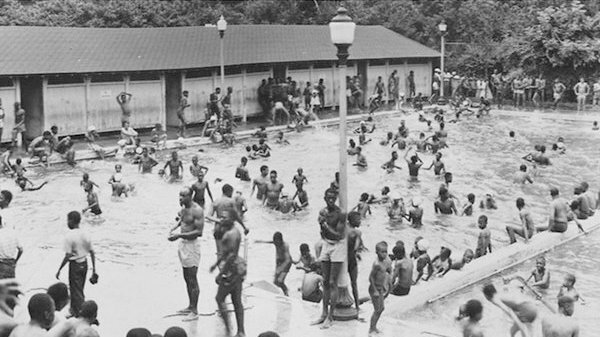 It was a series of drownings of African-American children in local waterways in the summer of 1953, according to coverage by The Afro, that drove the campaign against city pool policy. 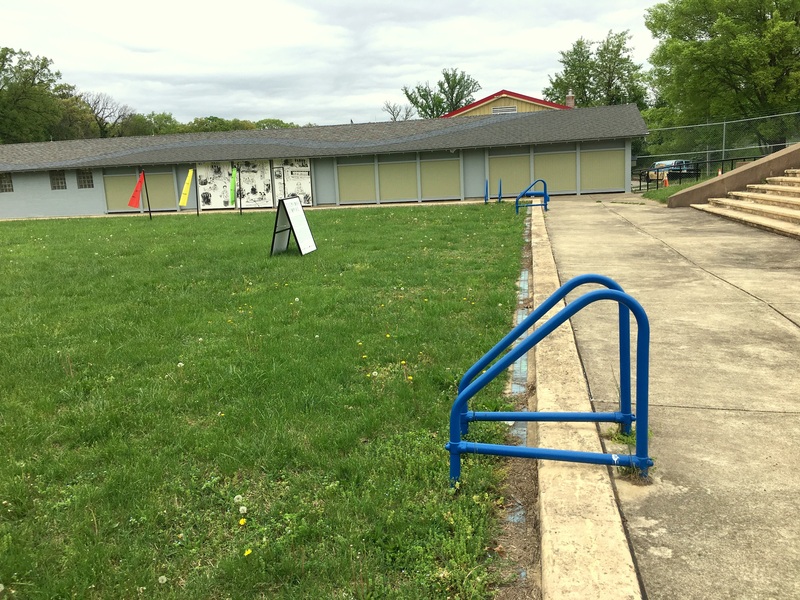 Pool #2 was the only city pool open to blacks – the rest were whites-only, including Pool #1, the facility in use today at 800 Wyman Park Drive. The accidental drowning of 13-year-old Thomas Cummings in the Patapsco River was the tipping point for the National Association for the Advancement of Colored People (NAACP), which pressed the Park Board to desegregate and eventually filed a lawsuit against the city. The battle went up to the Fourth Circuit Court of Appeals. The NAACP prevailed and, in 1956, the city opened up municipal pools regardless of race. “And none of the blacks went to the other side of the park to the white pool,” she said. “Desegregation is not the same as Integration. Desegregation gave black people the choice as to whether they want to live, work, and play separately or integrate. Integration gave white and black people alike an opportunity to integrate their neighborhoods and schools and businesses of their own free will.